I don’t write that much about events these days. Partly that’s because I don’t get invited to many and partly because when I do it’s for work. However, every now and again something pops up that I want to write about which doesn’t fit into the work basket and this is one of those times. A night of sherry, whisky and food at east London Galician restaurant Trangallan, which I’ve been meaning to visit for a while? Count me in. During my last jaunt towards sherry knowledge, the trip to Camino el Puerto del Canario that involved more food and beer than fortified wine, I lamented my lack of learning to Andrew Sinclair of Gonzalez Byass, along with a grumble that you don’t get as many chances to learn about sherry as you do other beverages. I must have made some kind of impression (my whining often does – it cuts to the soul) as a few weeks after I received an email asking if I wanted to come along to a ‘Learn about sherry’ session at the new Waitrose cooking school in Finchley. I, of course, said yes. The event was a joint effort between Waitrose, wanting people to see their new enterprise (the flooring of the entrance of which had only been laid hours earlier, so still rather new), Lustau (the supplier of Waitrose’s house sherry) and Gonzalez Byass (suppliers of brand name sherries), as well as including some matched food from Spain as prepared in the cookery school kitchen. We started the evening with a glass of Waitrose Manzanilla, bottled for them by Lustau. On the nose it had lemon zest, a bit of sour honey and a light nuttiness. To taste it started with a sweet fruitiness but quickly became dry, with olives, grass and woodiness, and a light sour finish. Quite nice, but still a little light for my liking. This accompanied a run through of how the evening would go – we’d learn about the sherry making process from Lustau’s Michael Hall and Byass’s Jeremy Rockett while Maria José Sevilla, the UK representative of the Spanish food and wine producers, ran us through some foods that could accompany the various sherries that Waitrose sell. Sherry is, by protected designation of origin definition, only made in the south west corner of Spain between Sevilla and Cadiz in an region known as The Sherry Triangle. The area is bordered by three towns: Jerez de la Frontera, Sanlúcar de Barrameda and El Puerto de Santa María, and the name Sherry is an anglicisation of Jerez. It’s very hot in the region and not great for growing grapes, although the chalky soil soaks up moisture when it does rain meaning that there is enough water for vines to grow even if their roots do have to dig deep. Most of the grapes grown are Palomino Fino, the base grape for sherry, but there is also some Pedro Ximinez and Moscatel produced, with PX often used as sweetener in wine and sherry production. Palomino doesn’t really make particularly great wine, it’s drinkable but isn’t that interesting, but the ‘magic’ of sherry production happens after traditional wine production has finished. The base wine is made to be dry and fairly bland with an alcoholic content of about 12-13% and is racked 500 litres per cask (not totally filling the casks, giving an air gap at the top) in January or February before it starts the journey of becoming sherry. There are two basic process for making sherry, each producing a distinctive style: Fino is pale and dry and Oloroso is dark and fruitier. Fino is made by taking the base wine and fortifying it to 15% by adding grape brandy. This strengthens the wine but isn’t quite strong enough to kill the remaining yeast in the mixture, which forms a layer on top of the liquid in the barrel called flor. The flor eventually covers the surface of the maturing sherry and stops oxygen from making much contact with the liquid, as well as digesting sugar and glycerol remaining in the mix. This, along with the flor’s helping along of further fermentation in the maturing sherry, gives the distinctive dry fino flavour. Oloroso, by comparison, is made by fortifying the base wine to about 17%, which kills off the remaining yeast and allows the sherry to mature without the protective flor. This causes the liquid to darken as it oxidises as well as becoming fruitier and sweeter as the oxidisation and remaining sugars work on the flavour. The various other sherries are made by altering these processes slightly as well as working with the traditional system of sherry maturation – The Solera. The solera system is method of maturation designed to give consistent results from year to year by blending sherries from different years and different levels of maturation. The maturing barrels are stacked about 4 high with the bottom row containing the oldest sherries and the top the youngest. 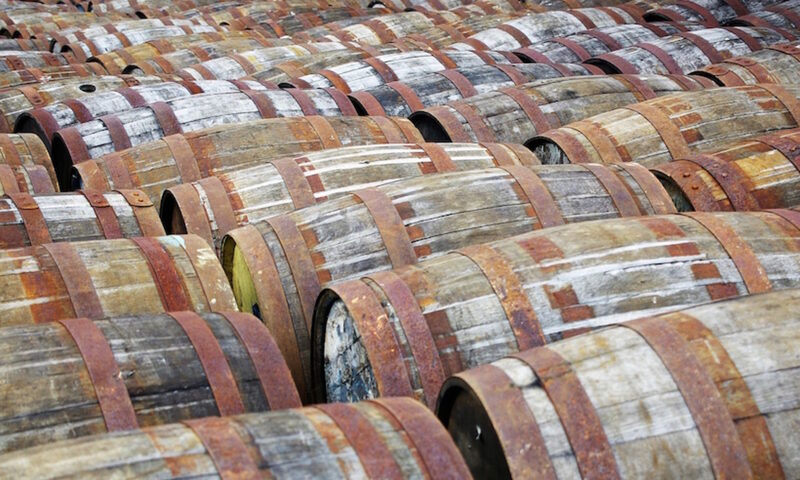 When sherry is taken from the solera it is always taken from the oldest casks, which are then topped up from the next oldest, which are in turn topped up from the next, and so on until there are no more casks to transfer sherry from. The youngest cask is then topped up with new sherry and the process starts again. As long as barrel is never emptied as part of the filling process this ensures that each barrel contains a blend of sherries of different ages and the constant transference of liquid towards the oldest ‘Mother Solera’ barrels evens out any changes in flavour from season to season to give a slowly changing but year-to-year consistent sherry. As the process doesn’t rely as much on the quality or flavour of the base wine it is the location of the maturation, as well as the quirks of the individual solera, which leads to the variations in the flavours of the different houses’s sherries. Our next sherry of the evening was the one that we opened the visit to Camino with – Tio Pepe Palomino Fino. The Manzanilla that we started with is a lighter version of the fino, made in a similar fashion, but you also get Manzanilla Pasada, which is aged longer and has more nuttiness. Tio Pepe is made in Jerez de la Frontera and is a benchmark of the standard fino style – a nose of lemons and honey with a quickly fading taste of soured grapes, citrus, yeasty undertones and wood. It’s a very light drink and is traditionally served very chilled to add to it’s refreshing nature. As a fino it doesn’t have much of a shelf life once opened – it oxidises quickly and goes off unless consumed within a couple of weeks – and the chilling also helps it keep for a bit longer. 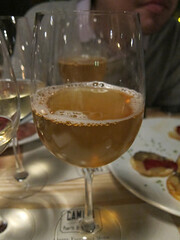 This sherry was matched with a prawn cooked with garlic, wine and pimento pepper. 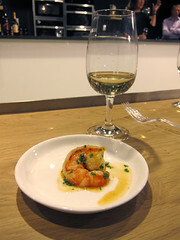 This worked really well – the flavour of the sherry fades quickly and the prawn filled the gap, the citrus flavours of the sherry cutting through the initial rich butteriness of the shellfish. We moved on to the next driest sherry on our list – Waitrose Dry Amontillado, again selected by Lustau. Dry amontillado is from the same family of sherries as finos but is darker and more complex due to a double maturation. 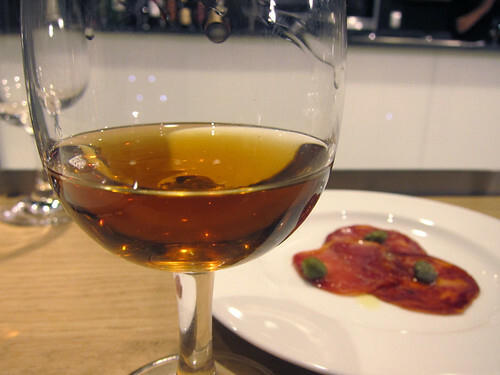 Wine is taken from the fino mother solera, as usual, but instead of being bottled as a fino it is further fortified to the 17% oloroso level and then run through a further amontillado solera. The fortification kills the flor and allows the wine to undergo a second oxidising maturation. On the nose it has raisins, bread and caramel – a chelsea bun in liquid form. To taste it has an initial fruity sweetness that fades very quickly to a dry, yeasty middle and a long sour grape finish. The sweetness on the nose is due to remaining glycerol in the wine rather than the usual sugars and the sweetness on the palate is due to a concentration of flavour during the maturation process rather than any particular production of sugars during the secondary solera. This was matched with a salad of warm broad beans, shaved manchego, smoky ground pepper, oil and salt which went very well – the earthy beans filled the dry hole in the middle of the wine’s flavour profile and the concentrated fruit of the wine provided a nice buffer either side, working well with salt and cheese. Next was La Concha Medium Dry Amontillado from Gonzalez Byass. An interesting style of sherry this, and one that is almost uniquely English and not generally found in Spain. Rather than being a true Amontillado it is instead a blend of regular dry Amontillado and PX to give a bit more of the fruity sweetness that is generally looked for in Sherry by us Brits. On the nose it was dominated by the PX, with raisins and toffee, but there was a hint of the sherry underneath with some dry hay coming through. To taste it had a rich raisin sweetness leading to a dry middle and lingering sweet and sour finish. This is the sherry that I’ve been drinking at Christmas for years and now I know how it’s made I can see why – I’m a big fan of PX but often find it a bit much. Cut the syrup sweetness of PX with some dry Amontillado and you have something that perfectly appeals to my sweet and sour loving palate. This was matched with three cured meats – lomo embuchado (cured pork loin), salsichon (a salami) and chorizo (coarse spicy sausage). The sweetness of the sherry cut through the strong spicy flavours of the meats, but not a lot more came through than that sweetness. We then moved on to the sweeter wines, starting with the Waitrose Dry Oloroso. Matured using the regular oloroso solera process this was a rich reddy brown colour with a rich and sweet nose of fruit, caramel and brittle toffee. To taste it had the now expected burst of sweetness followed by grapes and unripe apricot – not actively sweet, but rich and dry. The finish was long with dry wood and a prickle of alcohol. This was matched with croquetas de jamón – ham croquettes. This again worked really well with a one-two combo of rich wine cutting through dairy richness, combined with salty ham enhancing the flavours of the sherry. Second of the sweeter sherries was Apostoles Palo Cortado. This is a rarer style of sherry and one that isn’t particularly well known. The choice as to whether particular base wine is to be used for oloroso or fino is now governed by science(! ), with the chemical composition of the wines determining which process they will work best with. 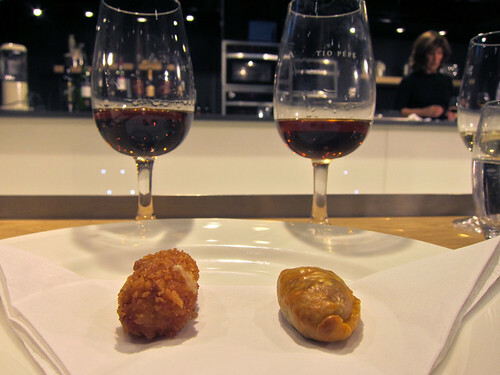 However, Palo Cortado starts with taking the best of the fino base wine and then fortifying it to 17%, as with oloroso. This wine is then aged for about 10 years in a single barrel rather than solera before being tested and, if it’s up to scratch, moved to a Palo Cortado solera for a further 20 years. Gonzales Byass, makers of the Apostoles, sweeten the wine with some PX when it goes into the solera, giving an old rich sherry which still has a chunk of dryness. It was a dark red wine with a nose of rich dried fruit, caramel sweetness and marzipan. To taste it had a deep wine sweetness with an astringent kick, and cherry stones (with a bit of flesh still attached) fading to a long fresh cherry finish. This was matched with a Galician Empanada – a Spanish pasty. It was mooted around the audience that this was made for similar reasons to the Cornish pasty, with both Cornwall and Galicia being known for mining, but either way it was a small tasty pasty that slipped down easily with the sherry, it’s pepperiness making a nice contrast and complimenting some of the richness in the middle of the wine. We next tried one of the more maligned sherries of the evening – Waitrose Rich Cream. Harvey’s Bristol Cream is one of the UK’s best known sherry brands and the one (along with Crofts) most associated with the ‘old bottle kept in a cupboard by your gran’ image that often goes along with the drink. In years gone by Harvey’s produced some excellent traditional sherry, but as time has passed their product has become more generic and without some of the interest of the older iterati0ns. This blend is an attempt to get back to some of that older style, mixing together old Oloroso with PX and Moscatel. On the nose it had a hollow sweetness with grass, vanilla, figs and marzipan – quite Christmassy. To taste it had dried fruit, booze soaked bread, sweet grapes and a bitter finish. This was paired with a Christmas pudding parfait of gingerbread biscuit, cranberry, orange and mixed peel studded vanilla cream parfait. 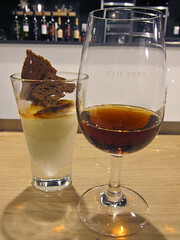 There were a wealth of common flavours and the astringency of the sherry cut through the richness of the parfait. I poured a drop or two of sherry into my dessert and the whole lot went a bit tutti frutti ice cream – a flavour that I haven’t had for ages. Our last sherry of the night was one that my recent run of tastings with Richard Paterson had introduced me to – Matusalem. More specifically that’s the name for Gonzalez Byass’s old sweet oloroso, but it’s also the expensive cask that Whyte & Mackay prize for production of some of their more expensive sherried whisky. Going the same direction as the Palo Cortado, this is also matured in a cask before hitting the solera, but spends 20 years on its own before meeting the marrying barrels. PX is introduced early on the maturation process giving this wine a rich sweetness beyond the regular olorosos. It also, like the other long matured sherries, increased in alcoholic percentage while maturing, as the climate in Andalucia causes water to evaporate rather than alcohol, concentrating the sherry and making it more boozy over time. On the nose it had wood, cocoa, sour caramel, pepper, cinnamon and dried fruit. To taste it was sweet with fruit to start and rested on a bed of sour fruits – cherries, peaches (maybe nectarines) and pears. It had a long smoky wood finish and a hint of what reminded me of musty cheese rind – a hint back to its yeasty beginnings as fino before the flor died. This was paired with mahon, a cow’s milk cheese from Menorca, and mebrillo, the quince jam often served with spanish cheeses. I’m not sure this entirely went, but the cheese was nice enough that I’ve been nibbling at a block this last week and the mebrillo was impressively smooth and sweet. From knowing nothing about sherry a few weeks back I now know enough to at least start asking the questions that will help me learn more. Unfortunately I’ve yet to find a Waitrose stocking many of the sherries from the tasting, but the Waitrose own range that Lustau have put together pops up in pieces in most of them. This post was written under the influence of Waitrose/Lustau Palo Cortado and I suspect that this year my traditional grabbing of a Medium Amontillado will be at least complimented, if not replaced, by a Matusalem, Palo Cortado and/or Dry Amontillado. Dryer sherries may not last all that long once opened, but I should get at least a month out of the stronger, sweeter ones, not that I expect them to last that long. Oloroso sherry. 20%. £8.19 from Waitrose stores. Many thanks to Andrew Sinclair and Jeremy Rockett from Gonzalez Byass for inviting me along. The tasting was free and filled with press, Waitrose customers, staff from elsewhere in the John Lewis group and me as the only admitted blogger. Just in case they’re reading I’d like to say hello to the lovely posse from the food hall at John Lewis on Oxford Street – thankyou for helping me find my way in to the cookery school and making sure that I ate my share of the olives. High on my list of boozes to learn about at the moment is the oft-maligned ‘granny’ drink that is sherry. I’m a bit of a fan, knocking back at least one bottle of amontillado at Christmas and having grown up in a household where abstinence was enforced before 6pm with the understanding that sherry didn’t count as drinking. I heard rumours earlier this year of a sherry bar near Kings Cross and eventually discovered the location of Pepito and Camino, the restaurant that it’s attached to. I’ve still not made it over to visit and was rather pleased to be contacted by their PR people and offered a chance to be taught about sherry with an intake of new staff. Unfortunately this didn’t line-up with the world of the corporate wage slave (my world) and I resigned myself to not seeing behind the scenes. However, the staff training wasn’t just for a regular intake but for a new restaurant and shortly after opening I was invited along with the regular crew of London food and drink bloggers to have a wander round the new location – Puerto del Canario…or Canary Wharf as you may know it. Situated right by Westferry pier on the former site of a Jamie’s bar it’s a restaurant of two halves – eating and drinking. Half of the restaurant is set up for sit down dining, the other with tall tables for more casual drinking with food. I think the same menu is served in both halves of the restaurant and it’s all spanish food, with a variety of sizes from small tapas dishes to main meals. I got to try some at the end of the evening and was very impressed – I’ll be coming back for certain, especially as it gives me an excuse to get the boat from London Bridge. I like boats. However, I was there to find out about the drinks. 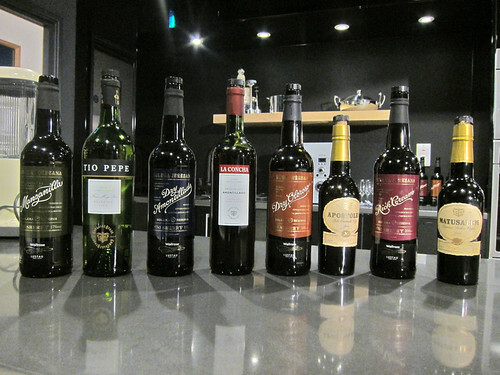 While they aren’t Pepito, they do still have range of sherries with at least one entry in each of the major categories. We started the evening with some Tio Pepe Fino Palomino. Camino work closely with Gonzalez Byass and this is one of their key sherry brands. Served chilled it was light on the nose, but there was a hint of grass with some honey hiding behind it. To taste it was much dryer than the nose suggested, with green grass, yeast and dry grapes. Those flavours ended suddenly with a hint of sweetness and the whole lot was capped with a woody finish. I’m not a fan of dryer sherries, but this was quite nice, if not really my kind of thing. To stick with the sherries for now, at the end of our meal we were presented with a choice of digestif. After a small amount of sweet talking I got to try both. 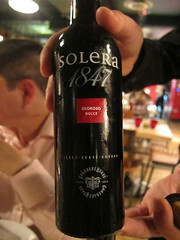 I started with a Solera 1847 Oloroso Dulce. On the nose it had the pressed raisin sweetness of a darker sweet sherry as well a whiff of vanilla sponge cake. To taste it had cinnamon in with the raisins and a hint of apple, all sitting on top of a light yeastiness. I quite like sweeter sherry and this has definitely added oloroso to my ‘investigate’ list. The other dessert choice was a Moscatel (that I know nothing more about other than that). 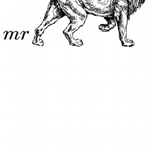 It was floral on the nose with light honey and a cloying perfumed floor cleaner astrigency. To taste the honey was dominant with the floral note hanging around and making the whole lot a bit intense and cloying. Not really one for me – a bit too much and more overpowering than the moscatel I have tried in the past. The bar does of course have much more than just sherry. Along with the food we were served a selection of spanish wine, starting with a 2007 Val de Sil Godello – a wine made in Galicia in north-western spain. My notes are annoyingly light now that I’ve looked into the grape a bit more (as I’d not heard of or tried it before) and read simply ‘Sweet sugariness. Hint of lemon’. I’ve only more recently started getting into white wine and this is on the list of things to try again. From there we quickly moved on to reds, with a Viñas del Vero Pinot Noir 2008 as the first. On the nose it had a underlying bloody meatiness with a hint of salt and sour cherry. To taste it was piney to start with strawberries in the middle and a lightly sour finish with sweetness down the side of the tongue. We then moved on to a Cillar de Silos Torre Isilo, made with Ribera del Duero grapes. It had pine, almonds, redcurrants, dry card and sour cherry on the nose. To taste it had both sweet and sour cherries, a clove spiciness, some vanilla and a tannic woody finish. Rather pleasant. Before I got to the eating stage of the evening I had a chat with a lady at the bar. She poured me a glass of 2009 Verd Albera (a rather nice peachy and lemony white wine) and after I did my normal waxing lyrical about spirits and cocktails she revealed that she was in charge of training the bar staff in the restaurant group and helped design the bars. The main design work is done by Interbar and currently (as of October 2010) the Camino Puerto del Canario bar is their flagship production – lots of fridges keeping wine at the right temperature (16°C for red, 6-7°C for white according to our tour), ice wells for chilling bottles and putting in drinks, and a general air of sensible lay out. After some further chatting about the wonders of whisky and cocktails (not what I expected in a Spanish bar and restaurant) I was presented with a whiskey sour. It was made with Four Roses small batch bourbon (which is a nice bourbon that I still need to grab a bottle of) and had a splash of Angostura bitters added for some spiciness, a twist I may have to try in the ones I make at home from now on. The last beverage type to taste was their beer. They have the regular range of cold fizzy yellow Spanish beer (as well as, according to the menu, at least one Spanish dark beer), but one in particular caught my eye – Inedit, a beer designed in collaboration between Estrella and Feran Adrià. Adrià is the owner and genius/madman behind El Bulli, a 3 star Michelin restaurant that often tops World’s Best Restaurant lists (and that I very much want to go to, but with only 8000 diners per year and over 2 million booking requests [places issued via a lottery] I doubt I will any time soon, especially as next year looks to be the last season that it will be around) and along with St Heston of Bray one of my food heroes. 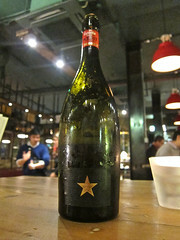 Estrella approached him asking for helping in designing a beer to go with food and Inedit is the result of their work. On the nose it has wheaty coriander and a light sweetness. To taste it has a burst of malty sweetness, with flowers and a hint of citrus that stops dead and is followed by dryness. It’s quite strange how quickly the flavour stops, but it seems almost perfect for food and claims to be ‘the first beer to be designed to accompany food’ (a lofty claim that I can’t deny with evidence but am sure others can) – a burst of beer flavour followed by a hole that is almost marked ‘insert food here’. Tastewise it’s quite similar to Hoegaarden, but slightly lighter and much clearer in appearance. It’s not that available in the UK, appearing in Utobeer and other specialist beer shops but Camino is the only restaurant I know serving it. Camino is most definitely on my list of places to visit again. I’m not a big fan of the layout bar side, with no general seating and the potential to become a noisy echo chamber as soon as it starts to fill, but their drinks menu is good and while similar it’s nicer than the other Canary Wharf drinking dens I’ve visited – it’ll be full of suits in no time… The restaurant was really good, an excellent addition to the crowded Canary Wharf scene and the easy access from the river (along with the accompanying view) is rather nice. To complete my need for sherry knowledge I still need to visit Pepito (and Camino: Cruz del Rey – they love the spanish names), but Camino: Puerto del Canario has filled the gap for now. Fino sherry. £3.50 for 100ml from Camino. £9.99 per bottle from Majestic. Oloroso sherry. £10.99 per bottle from Ocado. Pinot noirred wine. £24.50 per bottle from Camino. Ribera del Duero red wine. £59 per bottle from Camino. Spanish lager by Estrella and Feran Adrià. 4.8%. Many thanks to Krista Booker from Neon for finally finding an event I could come along to (and trying to push as many new boozes my way as she could through the evening), Andrew Sinclair from Gonzalez Byass for listening to me witter about how little I knew about sherry and cava, Richard Bigg, former wandering barman, now Camino boss and all round nice chap, and to the staff at Camino, who were smiley and helpful all night despite being confronted by 30+ freeloading bloggers. I was wined and dined for the evening at Camino’s expense and they gave us all a rather nice goody bag (I ate the cheese from it on the way home). They even put me on a boat for a bit, which was nice. I will be happily paying my own money to go again though and I wouldn’t do that if they weren’t actually good.